South Africa’s path to a welfare state has not been easy. For starters the problem of how to pay for social welfare in a country with too few taxpayers and not enough full-time employed citizens, has meant that social services have been rolled out first to those in most need — children, the disabled and the elderly. In recent months the ruling party announced the introduction of universal healthcare in the form of National Health Insurance and a number of pilot schemes in which the system would be phased in incrementally. 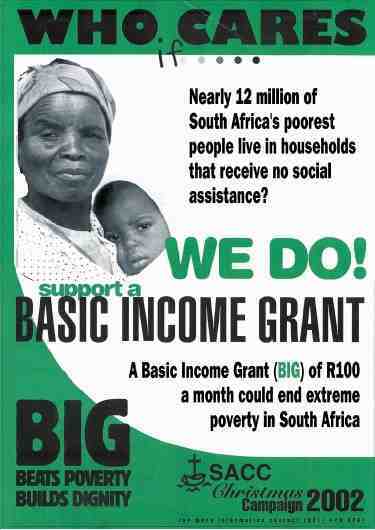 Although opposition parties and civil society groups have already called for a basic income grant for all citizens along with health care, South Africa has lacked both the political will and the means to achieve this goal. Both the Freedom Charter and our country’s Constitution enshrine the right of citizens to share in the wealth of the country but this promise has appeared out of reach, resulting in ongoing poverty for millions. The pressure on the state to deliver essential services while moving towards a technologically sophisticated industrial economy has resulted in political infighting with far left groups such as the Economic Freedom Front (EFF) demanding that private property be confiscated by the state in a plan that would essentially reduce the economy and the country to a communist dictatorship. In the new democratic order envisaged by post-Marxists like Tin the common ownership of property would exist side by side private ownership of property by individuals or organizations, as currently practiced in democratic countries. For example, land pieces sold by governments. The most important difference is that the proceeds from the lease or sale of common properties are distributed directly to all citizens equally. In South Africa where the dominant theme of wealth sharing and resource allocation is known as ubuntu, this makes sense, since there are limitations to what can or cannot be shared, necessitating the creation of shares, stocks and bond certificates. “The amount of citizen dividend per citizen depends on the country’s common wealth. The amount is expected to be very substantial in many countries. For example, in Alaska, the amount can be easily a few thousand dollars per resident. In Singapore, the amount is estimated at about $9000 per citizen. (The details are in the cases supplied by Tin below). The amount over a person’s lifetime is easily hundreds of thousand of dollars, or even a million dollars. So how exactly are we going to pay for all of this wealth sharing? Welll, South Africa has mineral wealth, the reserves of which remain some of the world’s most valuable, with an estimated worth of R20.3-trillion ($2.5-trillion). Overall, the country is estimated to have the world’s fifth-largest mining sector in terms of GDP value. Government investment in the economy is in the region of billions of rands and like Dubai plans are afoot to beneficiate mineral wealth and to move beyond this windfall to a modern information economy. “Careful institutionalization of citizen co-ownership and citizen dividend is essential. Past examples, e.g., the Alaska Permanent Fund and Alberta Heritage Fund, have shown that dividend funds without careful protection will be diverted by politicians to other “urgent” uses. A good protection is through Constitutional laws that require a high referendum to change. A normal law that can be easily changed by a simple Parliamentary majority is not much of a protection. The path towards a Basic Income Grant in which citizens gain financial freedom from birth and where the state essentially pays each and every citizen a basic salary every month is a long one. We may not ever get there as a developing nation, but we can certainly redistribute the nation’s wealth on a per annum or quarterly basis. There is no reason why the annual windfall from the state on the basis of co-ownership could not benefit us all in the same way that below par taxpayers already receive annual benefits from SARS in the form of a tax return. If you earn under R99 056 pa you already get your employees IRP pay deductions back, but if you unlucky enough to be unemployed you receive nothing. This is the gap which opposition parties need to fill in order to stay relevant to the 25% -36% segment of South Africans who remain unemployed.